Last August I was visited by two out-of-towners who were poking around on the Whidbey Art Trail, on which my studio is a stop. A woman and a man, she from California, he from Colorado — friends for thirty-five years. Delightful people. They stayed for an hour or so, touching many items, talking and laughing, admiring both work in progress and finished pieces. They left with assurances of see you again sometime and the like. I got back to work. About two hours later, they reappeared — a delicious lunch and a bottle of wine properly enjoyed in the interim. Very jolly, so the fun began. 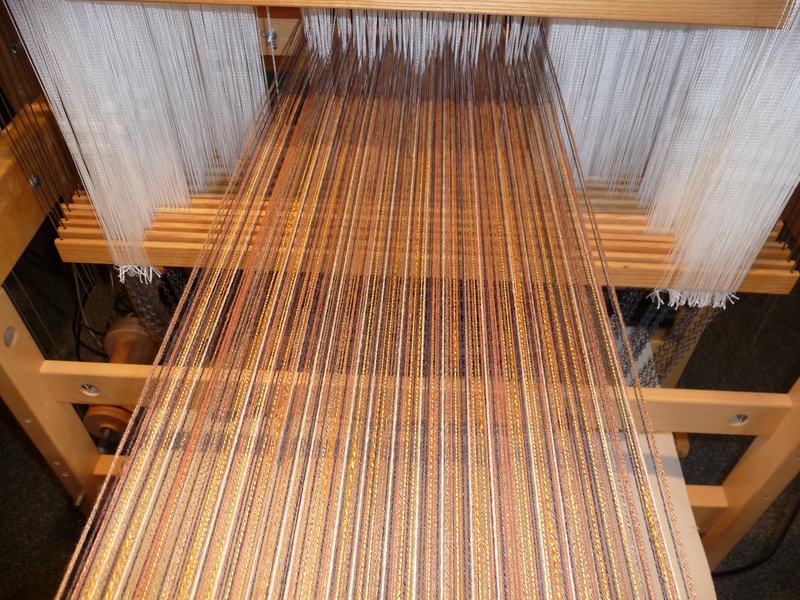 She ordered two of the Cloud Forest scarves which were on the big loom at the time; he commissioned a scarf for himself. We spent at least an hour with yarn samples and color cards spread over my work table, and ended by agreeing on colors, fibers and dimensions of the finished piece. The inspiration for this scarf gave me a few shivers. It’s to be worn with a coyote fur coat (and a mink one as well), so the yarn colors were selected to suggest the subtle coloration of the animal. Even now, I feel a bit queasy about this part, but am entirely pleased with the results. The weft yarn is an unusual rayon loop, soft taupe in color, and it gives the cloth a texture that’s subtle and interesting. 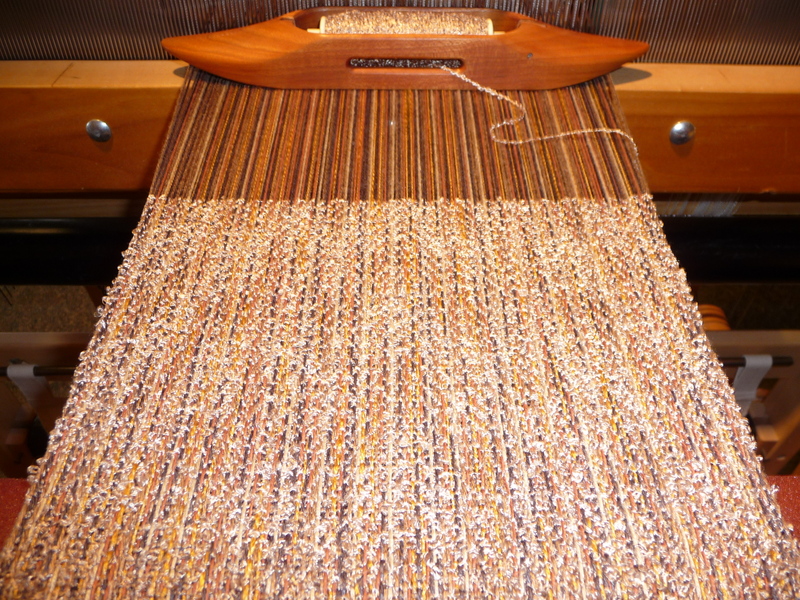 The finished scarf is shimmery and soft, drapes beautifully. Its owner is delighted with it, and will send me photos of himself wearing it with each of the coats. I promise to show them to you. There will be three more scarves woven in this series, which — for obvious reasons — I’ve named the Coyote Series. They’ll show up here soon. Be patient. The new owner must be howling at the moon in delight. Wait, coyotes do more yipping than howling. If they were mine, I would be howling, yipping, and skipping in delight!